THIS ITEM IS NOT AVAILABLE AT PRESENT. WE WILL NOT BE GETTING ANYMORE DC Comics New 52 Roller Derby Harley Quinn Action Figure. From the Batman collection by DC Collectibles. 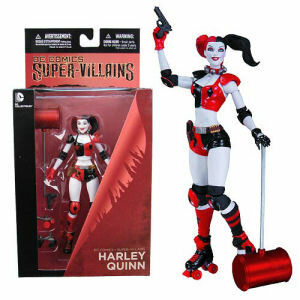 DC Comics New 52 Roller Derby Harley Quinn Action Figure. Harley Quinn is dressed in her red and black outfit and is on roller skates. Harley Quinn also comes with a red mallet and handgun. Action Figure stands about 6 inches tall. Ages 14 and up.